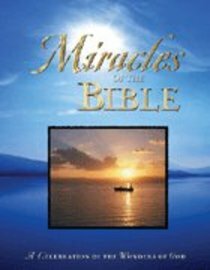 "Miracles of the Bible is a remarkable collection of the most memorable miracles recorded in Scripture. This comprehensive volume presents sexty-five miracles and combines them with vivid color photographs of ancient monuments and lands. Learn about the amazing acts of faith performed by Christ and his disciples, explore the geographical regions they visited and visit the sites where the miraculous events are believed to have taken place. A beautiful gift volume for Easter or any time. - Publisher Presents 65 miracles and pairs them with vivid colour photographs of ancient monuments and lands. Included are captivating photographs of sites such as the Nile River, Lazarus's Tomb, and the Cenacle in the old city of Jerusalem. Each invites readers to envision what the region may have looked like in times past, when the miracles unfolded, and captures the beauty of the Holy Land in present times. Each selection is a faith-affirming testament to the power of God. The awe-inspiring events in this book, along with its beautiful colour photographs and enlightening photo captions, bring a new appreciation for the miracles that have uplifted people of faith for generations. This truly is a volume to be enjoyed for years to come. About "Miracles of the Bible"
Presents 65 miracles and pairs them with vivid colour photographs of ancient monuments and lands. Included are captivating photographs of sites such as the Nile River, Lazarus's Tomb, and the Cenacle in the old city of Jerusalem. Each invites readers to envision what the region may have looked like in times past, when the miracles unfolded, and captures the beauty of the Holy Land in present times. Each selection is a faith-affirming testament to the power of God. The awe-inspiring events in this book, along with its beautiful colour photographs and enlightening photo captions, bring a new appreciation for the miracles that have uplifted people of faith for generations. This truly is a volume to be enjoyed for years to come.